If you want to get married at San Francisco City Hall on a Saturday, you have to pay $5,000 for 2 hours of time. Since City Hall is closed on Weekends you end up having the whole building to yourself. Only your guests and your professional helpers. 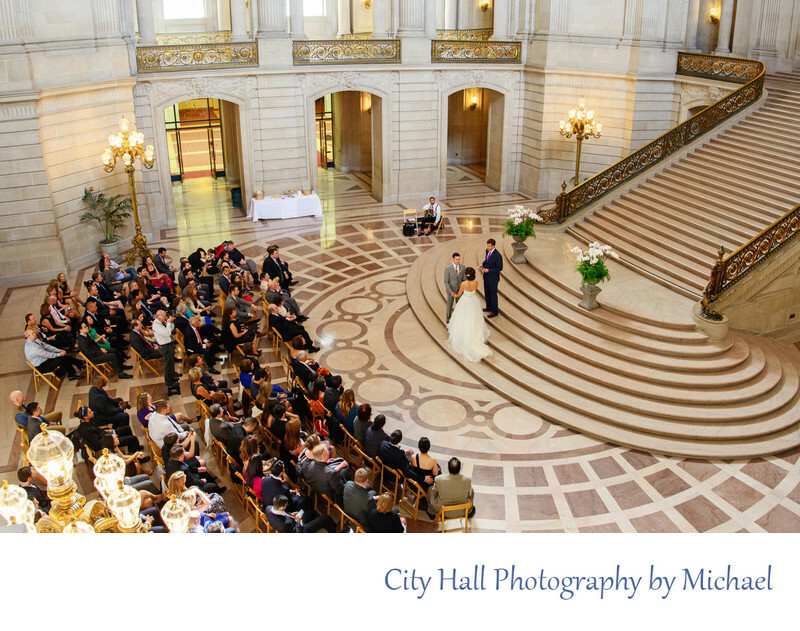 The City Hall event staff allow you to have access to nearly the whole building for professional wedding photography. The only floor they normally don't allow you is the 4th floor. Although on occasion if you allow yourself to be escorted to the various floors you may be able to hit the 4th floor North Gallery or the Mayor's Balcony. As you can see from the photo above, Saturday weddings are always on the Grand Staircase and they allow a pretty large crowd to attend.